Management theories are concepts surrounding recommended management strategies, which may include tools such as frameworks and guidelines that can be implemented in modern organizationsCorporate StructureCorporate structure refers to the organization of different departments or business units within a company. Depending on a company’s goals and the industry which it operates in, corporate structure can differ significantly between companies. Each of the departments usually performs a specialized function. Generally, professionals will not rely solely on one management theory alone, but instead, introduce several concepts from different management theories that best suit their workforce and company cultureGroupthinkGroupthink is a term developed by social psychologist Irving Janis in 1972 to describe faulty decisions made by a group due to group pressures. Groupthink is a phenomenon in which the ways of approaching problems or matters are dealt by the consensus of a group rather than by individuals acting independently..
Until the day that machines are able to think, talk, and experience emotions, humans will remain the most complicated beings to manage. Humans can never achieve the kind of error-free performance that machinesPP&E (Property, Plant and Equipment)PP&E (Property, Plant, and Equipment) is one of the core non-current assets found on the balance sheet. PP&E is impacted by Capex, Depreciation and Acquisitions/Dispositions of fixed assets. These assets play a key part in the financial planning and analysis of a company’s operations and future expenditures provide. On the upside, there are tons of things that machines aren’t capable of doing, making humans indispensable assets. For such reason, proper management is one of the most crucial things for an organization. For a long time, theorists have been researching the most suitable forms of management for different work settings. This is where management theories come into play. Although some of these theories were developed centuries ago, they still provide stable frameworks for running businesses. American mechanical engineer Frederick Taylor, who was one of the earliest management theorists, pioneered the scientific management theory. He and his associates were among the first individuals to study work performance scientifically. Taylor’s philosophy emphasized the fact that forcing people to work hard wasn’t the best way to optimize results. Instead, Taylor recommended simplifying tasks so as to increase productivity. The strategy was a bit different from how businesses were conducted beforehand. Initially, a factory executive enjoyed minimal, if any, contact with his employees. There was absolutely no way of standardizing workplace rules and the only motivation of the employees was job security. According to Taylor, money was the key incentive to working, which is why he developed the “fair day’s wages for a fair day’s work” concept. Since then, the scientific management has been practiced worldwide. The resulting collaboration between employees and employers evolved into the teamwork that people now enjoy. Systems management offers an alternative approach to the planning and management of organizations. The systems management theory proposes that businesses, like the human body, consists of multiple components that work harmoniously so that the larger system can function optimally. According to the theory, the success of an organization depends on several key elements: synergy, interdependence, and interrelations between various subsystems. Employees are one of the most important components of a company. Other elements crucial to the success of a business are departments, workgroups, and business units. In practice, managers are required to evaluate patterns and events in their companies so as to determine the best management approach. This way, they are able to collaborate on different programs so that they can work as a collective whole rather than as isolated units. The main concept behind the contingency management theory is that no one management approach suits every organization. There are several external and internal factors that will ultimately affect the chosen management approach. The contingency theory identifies three variables that are likely to influence an organization’s structure: the size of an organization, technology being employed, and style of leadership. There is no one specific technique of managing an organization. A leader should be quick to identify the particular management style suitable for a particular situation. The primary component of Fiedler’s contingency theory is LPC – the least preferred co-worker scale. LPC is used to assess how well oriented a manager is. Do you believe that every individual gets maximum satisfaction from the work they do? Or are you of the opinion that some view work as a burden and only do it for the money? Such assumptions influence how an organization is run. The assumptions also form the basis of Theory X and Theory Y.
Douglas McGregor is the theorist credited with developing these two contrasting concepts. More specifically, these theories refer to two management styles: the authoritarian (theory X) and participative (theory Y). In an organization where team members show little passion for their work, leaders are likely to employ the authoritarian style of management. But if employees demonstrate a willingness to learn and are enthusiastic about what they do, their leader is likely to use participative management. The management style that a manager adopts will influence just how well he can keep his team members motivated. Theory X holds a pessimistic view of employees in the sense that they cannot work in the absence of incentives. Theory Y, on the other hand, holds an optimistic opinion of employees. The latter theory proposes that employees and managers can achieve a collaborative and trust-based relationship. Still, there are a couple of instances where Theory X can be applied. For instance, large corporations that hire thousands of employees for routine work may find adopting this form of management ideal. One of the reasons why managers should be interested in learning management theories is because it helps in maximizing their productivity. Ideally, the theories teach leaders how to make the most of the human assets at their disposal. So, rather than purchase new equipment or invest in a new marketing strategy, business owners need to invest in their employees through training. It can be seen in Taylor’s scientific management theory. As mentioned earlier, Taylor proposed that the best way to boost workers’ productivity was by first observing their work processes and then creating the best policies. Another area where management theories have proven to be useful is in the decision-making process. Max Weber proposed that hierarchical systems encourage informed decision-making. A report written by the Institute for Employment Studies suggests that flattening the hierarchy paves the way for local innovation while speeding up the decision-making process. Flattening out entails getting rid of job titles and senior positions so as to inspire a cohesive work environment. Management theories developed in the 1900s, aimed at encouraging interpersonal relationships in the workplace. One such theory that encouraged a collaborative environment is the human relations approach. According to this theory, business owners needed to give their employees more power in making decisions. Throughout history, companies have been putting different management theories into practice. Not only have they helped to increase productivity but they have also improved the quality of services. Although these management theories were developed ages ago, they help in creating interconnected work environments where employees and employers work hand-in-hand. 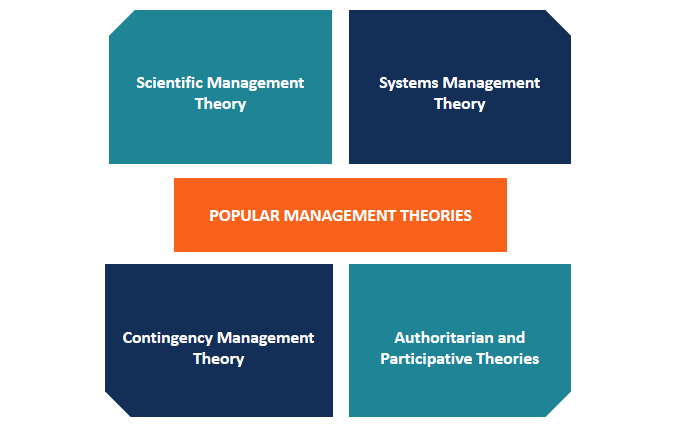 Some of the most popular management theories that are applied nowadays are systems theory, contingency theory, Theory X and Theory Y, and the scientific management theory.